I have not made scrambled tofu for a while and I'm not sure why. It is easy to make and incredibly tasty. You really can use whatever veggies you have in the crisper to jazz up your tofu, but this combination works very well (and looks so pretty). 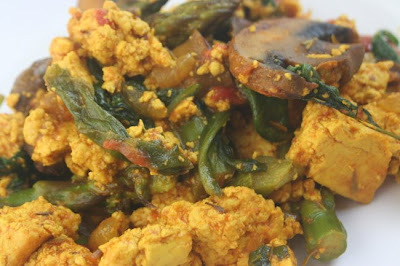 I know that scrambled tofu has become fairly ubiquitous in vegan bloggerdom, but here is the recipe anyway. 1. Saute onion and garlic in a saucepan over medium heat for 5 mins. Add mushrooms and saute until they release their water and have reduced in size. Get the asparagus steaming. 2. Add water, spices, tofu and mix well. Cook for 5 mins, adding more water if it gets too dry. Add tomato and cook for 3 mins. Add asparagus and spinach and reduce heat. 3. Cover pan with a lid to let spinach cook. Remove lid and mix everything well.